I have recently moved to the Scottish Borders and will be hosting some Workshops in this area in the near future. Please contact me at admin@alisontait.co.uk if you would be interested in further information. ﻿I currently teach 2 art classes for children at Penicuik Arts Center on Friday afternoons. The first class is for younger children and is more craft based. ​The second class is aimed at older pupils and children with a keen desire to draw and paint. Contact me if you wish to inquire about either of these classes. I also teach children art and craft workshops after school and as Birthday parties. The children cover a huge variety of activities from traditional painting and drawing to felt making, pottery, fabric painting and lantern making. I really enjoy working with schools to produce tailor made projects. I worked with East Feast on a number of projects in 2013 and 2014. In July 2015 I worked at Mauricewood primary school in Penicuik to create a project on the theme of recycling and changing an environment. 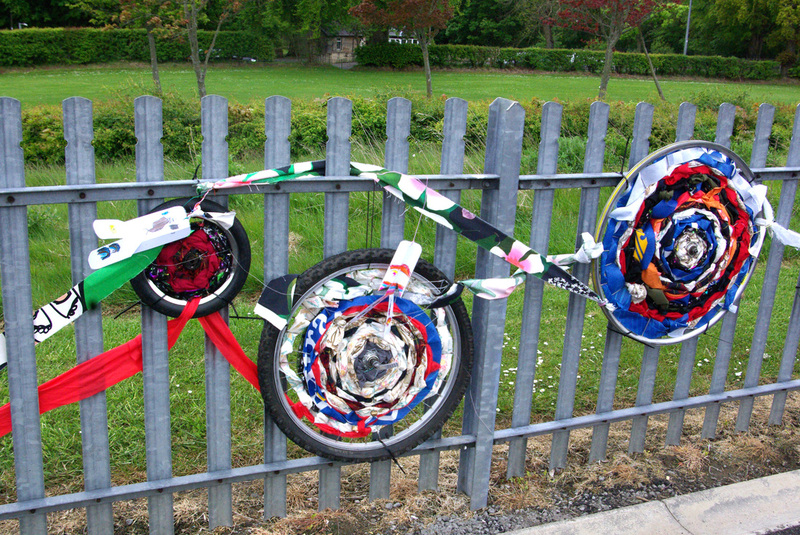 We wove fabric through bicycle wheels and made a dynamic art piece full of movement along the railings in the playground.